In early March, a terrorist attack took place in southwest China’s Kunming, leaving 29 dead and more than 130 injured. The attack was attributed to Uyghur separatists. In early April, also in southwest China, a shooting incident occurred on the Sino-Vietnamese border — a group of Uyghurs trying to escape China seized guns from police and opened fire. Some weeks after that, President Xi Jinping visited Xinjiang, including the southern region where the religious beliefs are most devout. While there, Xi expressed a desire to be close to the people while also emphasizing his commitment to fighting terrorism. However, soon after he left Xinjiang, there was an explosion in the railway station of the capital, Urumqi. There is no doubt that the last 10 years have brought unprecedented media exposure for Uyghurs. As a journalist, I believe this media attention derives from a nameless sense of alienation and fear. For decades, Uyghurs have lacked a basic sense of belonging, and there has been a deficit of trust with the majority Han ethnic group. While Chinese officials work hard to promote ethnic unity and praise Uyghurs, on the internet Uyghurs are usually targets for criticism, widespread enough to be seen by every Chinese netizen. As a result, Uyghurs have two faces in China: one peaceful and good, the other terrifying. The former is the image publicized by China’s official media. The “fearful” face of Uyghurs represents the attitude of more and more people influenced by social media, and is a growing problem for China. After the explosion in Urumqi, the “two faces” of Uyghurs were readily evident in public discourse. After the attack, People’s Daily, the newspaper of the Chinese Communist Party, posted to its official Weibo account a “Joint Letter by Uyghur Students.” The letter harshly criticized the violence against civilians and accused the terrorists “of hijacking the entire Uyghur nation.” The article represented the official voice of China, calling for ethnic unity. The Weibo post has been forwarded 10,000 times, but has only 11 comments. It’s clear that authorities are worried about online discussions on this topic, so they are “screening” speech. The Uyghurs’ online image goes deeper than fears of terrorism. Some netizens’ personal experiences also contribute to negative perceptions of Uyghurs. For example, on Sina Weibo, netizens have urged travelers never to take a Uyghur-driven taxi in Xinjiang. “The Uyghur drivers are terrible, in addition to taking detours, they might try to intimidate you, it’s really terrible… This is my first time in Xinjiang, and I swear it’s also the last!” Online, it’s easy for one person’s personal experience to become a source of prejudice against all Uyghurs. Such emotional speech not only endangers the image of Uyghur, but also affects all of Xinjiang. Though many associate Xinjiang with Uyghurs, Xinjiang is just a geographical term, describing a region that accounts for one-sixth of China by area. That’s why the government pays such close attention to Xinjiang — it’s more important to China than Crimea is to Ukraine. Although Xinjiang is officially called a “Uyghur Autonomous Region,” in fact, Uyghurs account for fewer than 50 percent of Xinjiang’s population. Sometimes, netizens criticizing Uyghurs use the phrase “the people of Xinjiang,” which upsets the many Han people living in Xinjiang. The Han people in Xinjiang want to maintain a distinction between themselves and Uyghurs. In my own life, I’ve had experience with both “faces” of the Uyghur population. For example, there are many Uyghur street peddlers in Beijing. To be honest, I get nervous when dealing with them. Too many experiences have taught me that if you even ask them the price of something they sell, they might try to cheat you or intimidate you into buying something. I’ve even been told by police not to walk through Uyghur-populated areas at night, in order to avoid being mugged. 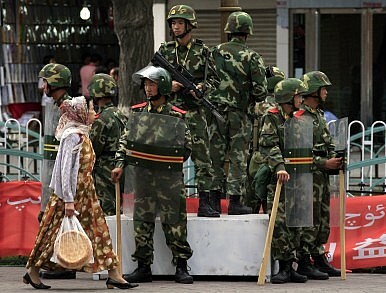 Due to these concerns, Uyghur areas are always frequently patrolled by the police. However, other personal experiences with Uyghurs have been very different, and helped me to understand the problems facing this ethnic group. When I was in the college 10 years ago, I had a Uyghur friend. Some readers may not know that China has “affirmative action” for minorities: to provide more opportunities for Uyghurs, the minimum college admission score for them is much lower than it is for Han Chinese. My Uyghur friend was very grateful for this policy, which gave him an opportunity to experience college life in Beijing. However, many of the Uyghurs at my school formed a small circle, and rarely took the initiative to associate with Han people. They spoke only the Uyghur language when together. Even 10 years ago, there seemed to be a barrier between the Uyghur and Han ethnic groups. I’ve always remembered his words. Yes, how many Han people understand or are willing to learn Uyghur? Perhaps only by getting fully familiar with a language can we truly understand this nation and culture. The language barrier might be one of the causes of estrangement. In fact, the question has bothered me for a long time, as it probably has senior government officials. The Western media will say that the increase in terrorism represents a failure of Chinese national policy. But at least some Uyghurs disagree. Two months ago, I was doing interviews at China’s “two sessions”: the National People’s Congress and the Chinese People’s Political Consultative Conference. I met Nur Bekri, Chairman of the Xinjiang Uyghur Autonomous Region. When I asked him about China’s ethnic policy, he practically shouted: “I think China’s ethnic policy is the best in the world!” His answer was that of a loyal Communist Party member, and a model of the ethnic unity China’s officials always promote. Like Bekri, I disagree with the idea that China’s ethnic policy has failed. But unlike Bekri, I believe there have been problems in implementing the policy. I know a Uyghur who moved to Turkey from Kashgar in the 1990s. In a letter, he complained that he has applied for a visa to visit relatives in China several times, but each time he was refused. It’s also difficult for his relatives to leave China to travel. My friend said he no longer thinks about returning to China. Actually quite the opposite — more and more Uyghurs want to leave China. This is indeed a problem: If there is no sense of belonging, then leaving will be the last resort. A growing feeling of alienation within China may be the reason behind the recent Uyghurs smuggling cases in Southeast Asia that we’ve seen reported in the media. I once wondered if this Uyghur friend was an “East Turkestan separatist.” However, his job is to promote Chinese culture in Turkey, displaying bilateral friendship. I don’t think that “East Turkestan separatists” generally help promote China. Yet if he’s not a “separatist,” but still is glad to have left China, doesn’t this speak to a larger problem? Many Uyghurs do not feel a sense of belonging and identification with China. Whenever the media reports on terrorist attacks in China, I cannot help but think of these two Uyghur friends. Many people in China equate Uyghur with terrorism, one of the dangers of the “ugly face” of Uyghurs displayed on social media. I don’t know how long other Chinese will continue to fear Uyghurs, but it’s absurd to conflate some Uyghurs terrorists with the entire Uyghur population. China should be wary of racism. The “ugly face” of Uyghurs online is contributing to the feelings of alienation in the Ugyhur community, which only increases ethnic tensions. To give ethnicities with different appearances, different languages, different beliefs, and different cultural traditions a sense of common identity will require a more concerted effort on the part of Xi Jinping. He can’t be intimidated by the sound of explosions in Urumqi Railway Station; this is a sign that he must redouble his efforts to forge a true “ethnic unity” in China. As long as there is a lack of trust and understanding between Uyghur and Han, as long as the “two faces” continue to create prejudice against Uyghurs, ethnic unity cannot be a reality.